In our beach-side garden setting, the Spa at Four Seasons Resort Bali celebrates the healing and cleansing powers of water. In an atmosphere that feels fresh, open and uplifting, intuitive Four Seasons care brings you to a state of deep relaxation while guiding you towards lasting wellness. As the sea breeze caresses your skin and the sound of gently lapping waves creates a soothing rhythm, experience a selection of decadent rituals in an open-air, thatched-roof hut at the edge of Jimbaran Bay. Our oceanfront treatments are perfect for individuals and couples. Eight luxurious treatment rooms are part of the 1,000-square-metre (10,760-square-foot) facility. Three spa suites feature double massage beds, a Swiss shower, and wet and dry body treatment areas. The suites open onto a garden courtyard with a large soaking tub and a cascading rinse shower. THE ROYAL SPA SUITE private salon offers the ultimate in pampering. Signatures of the Spa, Oceanfront Treatments, Asian Wellness and Healing, Couples' Treatments, Facials, Body Scrubs, Massages, Body Envelopments, Salon Services, Yoga, Holistic Treatments. Our spa treatments blend elements from traditional recipes with modern-day beauty rituals. Spa treatments 9:00 am – 9:00 pm, Spa facilities open 6:00 am – 9:00 pm. Enjoy a selection of treatments in an open-air bale at the edge of Jimbaran Bay. For a romantic couple’s escape, relax with a side-by-side ritual. Relaxing and Refreshing – THE SPA JUICE BAR serves healthy fare, juices, jamus (herbal drinks), tea and coffee. On the outdoor terrace, guests can relax with refreshing tonics and herbal elixirs. IN-ROOM SERVICES - All massages, body scrubs and facials can be enjoyed in the privacy of your villa. OCEAN OPULENCE - Feet are soaked in mineral-rich seawater. Then therapist performs head massage to stimulate blood circulation. Body scrub with blue sea salt to exfoliate the skin, warm-seashell body massage. A drink of fresh young coconut water. WATER VALLEY - Retreat to a secret spot on the rocky shoreline, near our private waterfall. Treatment begins with a gentle dry brushing of the body, followed by flower rub. Enjoy a Balinese massage with steamed herbal compresses to ease muscle tension. A hydrating facial using luxurious anti-ageing and soothing products. FIRE & SKY – In a welcoming oceanfront bale. 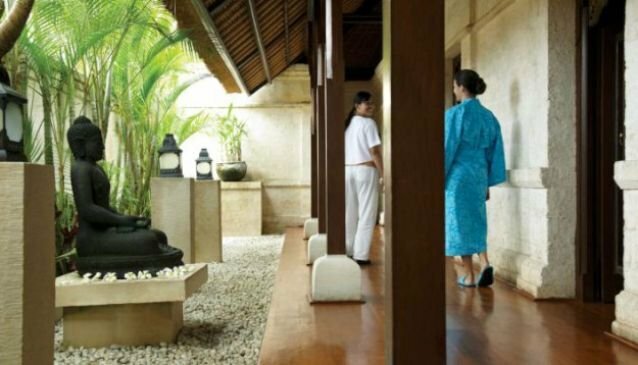 Your experience begins with interactive Indonesian martial arts, white crane stretching and breathing exercises, an invigorating traditional Balinese silat – a massage featuring rolling, stretching and deep-pressure techniques using heated bamboo rods. Concludes with a point-of-light meditation to anchor your sense of calm. WIND & WATER - This ritual begins with a traditional Balinese coconut water purification ritual. Then engage in an interactive 14-wind meditation designed to open your body to the curative power of the universe. Enjoy a coconut and pearl cream scrub and a Balinese massage that eases muscle tension. Next, a hydrating and detoxifying coconut and seaweed-aloe gel wrap includes a cleansing mandi tirta (floral water ritual). Concludes with a replenishing and cleansing tamarillo juice. SUN & SOUND - Enjoy a 15-minute “sound bath” in the deep, soothing sound waves and tones created by Balinese gongs. You are then treated to a sensual sun lover’s ritual, including a 60-minute glass stone massage with aloe and cocoa blossoms, and a hydrating facial with a boost of wild basil and neroli serum. MARINE ALGAE: Cleansing Waters - This deeply re-energizing and detoxifying full-body experience starts with an exfoliation using warmed Himalayan salt to provide the body with negative ions, restore its energy field and improve blood flow. A wrap with mineral-rich algae assists in the absorption of essential trace elements and minerals, promoting detoxification. After a soothing bath to conclude the ritual, a deeply cleansing and rejuvenating facial leaves the skin looking lustrous and glowing. BIO-RHYTHM: RESTORING WATERS - Restores the body’s natural biorhythm and relaxes the nervous system. Both the energy scrub and mud wrap contain high levels of minerals in ion form, which emit large amounts of negative ions, charging and restoring the bio-magnetic energy field. Finishes with an ayurvedic marma massage for the face. Mimpi Manis: DREAMING WATERS - Sleeplessness is an epidemic in the West. Mimpi Manis, meaning “sweet dreams,” helps to inspire inner tranquillity and blissful sleep. First, a Vichy shower soothes the nervous system. Dreamtime music and water gently poured over your body. Continues with ayurvedic marma-point massage and chakra healing before concluding with a mimpi manis face massage. Salon facilities and services include four hair stations, two manicure/pedicure stations, a separate area for cream baths, and traditional oil treatments for the hair. Hair services - Nail care - Depilation care - Full leg wax - Half leg wax - Underarm wax. Every day 9:00 am – 9:00 pm. TRADITIONAL OIL - Balinese keep their hair lustrous with fresh coconut oil infused with pandanus leaf, fenugreek seed, sandalwood and cinnamon. We apply this treatment using a relaxing scalp, neck and shoulder massage to stimulate blood circulation. MINT HAIR MUD MASK - Essential oils of peppermint, tangerine, rosemary and lavender are combined in a deep-conditioning, clay-based mask that is massaged into the hair and scalp. This is offered in combination with a relaxing hand and shoulder massage, tangerine-mint botanical hair wash and conditioner. BALINESE MASSAGE is renowned the world over. We are pleased to offer you the opportunity to experience authentic techniques in a range of relaxing variations. Traditional Balinese massage techniques are passed down through generations. The healing massage uses long strokes, gentle skin rolling, deep kneads and foot reflexology. A restorative massage oil, made from herbal coconut oil blended with essential oils, is chosen especially for you. YOGA CLASSES – The Resort offers four different classes for yogis at all stages of their development, from beginner to expert. Detox and cleanse by working up a sweat through a heat-building sequence of dynamic and vigorous postures. This Vinyasa class is enhanced by Bali's natural humidity and a candlelit ambience, creating a perfect environment for hot yoga. In the magic of Bali's twilight, you'll work up an appetite and lay the foundation for a good night's sleep.